A potted history and the start of a Blog. “THE FARM”, or Tarrahill as it is now known, was bought in 1988, just a narrow 30 acre paddock squeezed between two neighboring places and nothing much to recommend it other than it was for sale, we could afford it and it had spectacular views all around the Yarra Valley. My father was already making wine using grapes grown at home in nearby Lower Plenty so, after a cursory consultation with an agricultural consultant who said that grapevines would grow on the site, the first thing we did was to plant 5 acres of Cabernet sauvignon, Merlot and Cabernet Franc on the north slope for my father’s use, and then 3 acres total of Cabernet Sauvignon and Shiraz on the south slope with rows running east-west. Wrong from the start it would seem! We had 4 very young children at this time and I fear that they have been permanently put off viticulture by being made to help unclip nets, pick grapes all day, and wait until after dark for meals while their crazy parents drove tractors, pruned vines and never stopped still except to sleep. 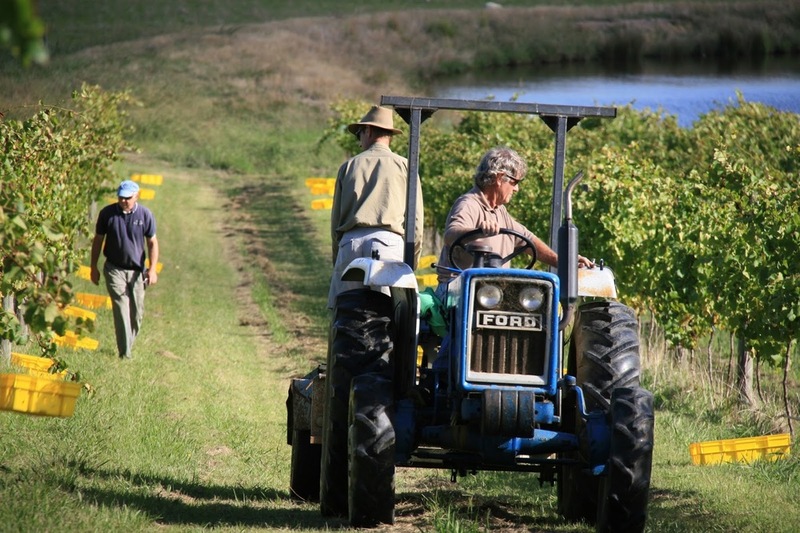 “The Farm” was expanded twice over the following 20 years making 65 acres in total in 2013. 12 years ago we extended the vineyard, planting 15 acres of Shiraz and Pinot in the southern paddocks. At this time some common sense prevailed and we engaged a vineyard manager, Tony, to help both us and my father, and allow us to better attend to our day jobs and talk to the children occasionally! In addition to planting grapevines our main focus has been on revegetating the property. Every year we plant hundreds of trees and shrubs, learning gradually what types do well in the local climate and will survive the grazing habits of the numerous horses that we have accumulated. The recent long drought has taken its toll and many of the original trees, particularly the natives, are making good firewood. The dependable species are the oaks and elms, providing welcome shade for all in the summer and wonderful mulch for the pastures in autumn. We are following Peter Andrews model for the farm layout and are developing a dense woodland on the top of the ridge with water and shelter for the animals, grazing paddocks below and then the vineyard below that. Water run-off from the hill is diverted at intervals to slow its descent and much of it traverses the vineyard before reaching the dams at the low point of the property. Biodiversity is considered to be essential and the property is looked at as a whole with the vines just part of it. We have begun to plant “insectories” around the vineyard, plantings of native shrubs that are known to encourage insects and birds that feed on pests commonly found in vineyards. The house now has a mature ornamental garden full of diverse species, as well as 3 vegetable plots. Diversity is important in the vineyard as well. 5 years ago we removed one of the Pinot clones entirely and replaced it with Chardonnay , a French clone called Mendosa. In February 2009 the Kilmore fire more or less had its southern boundary at our house. We were as unprepared as most people and it was only the wind change that stopped the fire. As a result the 5 acres of vines on the northern slope had to be removed leaving only 20 acres on the south side. Last year we removed all the younger shiraz vines, about 4 acres, and replanted with more of the Cabernet family, a mix that is found most commonly in the Bordeaux region of France ie: Cabernet franc, Malbec, Merlot, Petit Verdot and more Cabernet sauvignon (and multiple clones of each variety). We are looking forward to learning how each develop on our site. Within the vineyard we have also planted a small orchard, berries and old bush roses which we hope will encourage small birds and beneficial insects. My studies of Permaculture and Biodynamics have influenced many of our decisions made here at Tarrahill, particularly in the last few years. This is our second year of applying Biodynamic sprays and we are pleased to see that the plants and animals are very healthy and robust. I have, on order, a handful of sheep that we hope will keep the grass and weeds down and help us do without herbicides. We use no pesticides at all and only minimal fungicides. Husband, Jonathan, and our good friend, Geof, finally graduated as Bachelor of Applied Science, winemaking, a couple of years ago, so our next step has been for them to have some practice. As a result, we have out first release imminent: the 2010 Cabernet sauvignon, Shiraz and Chardonnay. This has required that we also learn about labels, packaging, signage, websites and a whole lot of other stuff. Lea Wearne, our son’s lovely girlfriend and very capable graphic designer, has been our guide in all this and has been incredibly patient while we procrastinated for weeks over tiny details. Finally, her fast approaching departure overseas has brought decisions and results.